A homeless man in Denver draws heroin into a syringe. Treatment centers in the city say patterns of drug use seem to be changing. While most users once relied on a single drug Ã¢ÂÂ typically painkillers or heroin or cocaine Ã¢ÂÂ an increasing number now also use meth. Counselor Melissa McConnell and patient Sara Florence look at a computer screen at the Denver Recovery Group, a treatment center. Huddled at a computer screen at the Denver Recovery Group, counselor Melissa McConnell looks at the latest urinalysis results for her client, Sara Florence. Last fall, it lit up like a Christmas tree. Now it's all clean. Florence says she stopped using heroin five months ago; she stopped using methamphetamine not long after that. "Shooting it, smoking it, snorting it," Florence says. "It's horrible, just made me feel like crap, you know. But I'd still did it. Just makes no sense, you know. It's just really addicting." Meth is particularly insidious, she says, because it's cheap, readily available and "very common. Everybody does it." Her assessment is in line with drug-overdose numbers from Colorado's Department of Public Health and Environment, which show meth's enduring presence in the state. The drug was found in the systems of 280 Coloradans who died of overdoses in 2017 — up sharply from the year before. That number was more than five times that recorded in 2012. Denver Recovery Group's executive director, Denise Vincioni, says her organization still sees "rampant use of methamphetamine." It's very difficult to treat on an outpatient basis, she says. Admissions for the use of methamphetamine to what was once the state's largest drug treatment facility — the now-closed Arapahoe House — almost doubled from 2013 to 2017. Statewide figures for meth-related treatment admissions have also risen steadily over the last five years. And there's a new twist, Vincioni says: In the past, users mainly seemed to stick to one drug — opioid pills or heroin or cocaine. Now, they're using those along with meth. "They're almost going hand in hand," says Vincioni. McConnell says once people come in for treatment, "They start to get off the opiates, but their meth use increases." Contrary to the portrayal of meth production in popular TV dramas, the meth in Colorado these days is rarely cooked up in neighborhood basements from local drugstore ingredients. Instead, it's mostly imported, often along the same routes as heroin. "I would say almost 100 percent of our meth comes from Mexico," says Tom Gorman, director of the Office of National Drug Control Policy's Rocky Mountain High Intensity Drug Trafficking Area. Much of it is mass produced there, he says, in "superlabs." The drug's continued impact shows up in police statistics. Denver arrests for possession of meth nearly tripled in 2017 compared to 2013. The amount of methamphetamine seized by HIDTA-funded drug task forces across Colorado, as well as by Colorado state patrol officers, went up sharply from 2016 to 2017. Meth has been overshadowed by opioids and marijuana in news headlines in Colorado recently, Gorman says, but "we've had a meth problem in this area for a long time." Are more people using the drug now? "Maybe," he says. "But it's always been our number one problem." Sara Florence at the Denver Recovery Group is a 36-year-old mother of three. Her reliance on drugs started early, she says — at age 15, when her parents gave her pain pills for a toothache. Just like that, she was hooked. "I grew up around it, you know," Florence says. "It was around me, my environment. Both my parents were addicts, and so, you know, it was kind of rough not to be one." Those troubles eventually led to heroin and an eight year struggle with meth. The day she got arrested for stealing a Subaru was when she hit bottom, Florence says. "I was homeless and had nowhere to live, and driving the stolen vehicle and sleeping in it." The ultimate charge, Florence says, was "aggravated motor vehicle theft." Then it was off to drug court and eventually to the Denver Recovery Group. After seeing her drug test come back clean, counselor McConnell gave Florence a big hug. "It's just so much better quality life now that I'm not doing anything," Florence says. "This is the cleanest I've been since I was 15 years old." Still, Vincioni worries about the impact of this latest meth surge — how it could affect her clients. People with a dependency on more than one drug are that much harder to treat, and that limits their chances of "continued sustained recovery," she says. 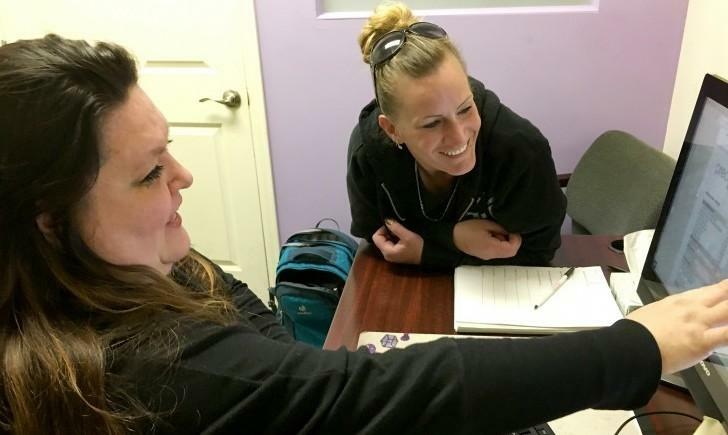 Her facility treats clients on an outpatient basis, but Vincioni knows that many would need more intensive inpatient services to deal with a meth addiction. "It's very difficult to stabilize patients who continue to use meth," Vincioni says. If a client drops out of the treatment and counseling program at Denver Recovery Group, the staff often doesn't know what happens to them. The worry is they might not survive. And as the U.S. wrestles with the opioid epidemic, the use of one stimulant, methamphetamine, is surging. And it's one of the hardest addictions to overcome. From Colorado Public Radio, John Daley has this on the stubborn presence of meth, especially out West. JOHN DALEY, BYLINE: At a drug treatment center in Denver, counselor Melissa McConnell huddles around a computer screen with her client Sara Florence. MELISSA MCCONNELL: Just look where you were. Look where you were in November, and look where you are in March. DALEY: On the screen, the pair look at Florence's urinalysis results. A few months ago, McConnell says, it lit up like a Christmas tree with positive tests for multiple drugs. Now, it's all clear. Florence says she stopped using heroin in the fall. She takes methadone to deal with that. She stopped using meth, Jan. 2, 2018. SARA FLORENCE: Yeah, I got pretty bad on it. I was shooting it, smoking it, snorting it. It just made me feel like crap, you know? But I still did it, which makes no sense, you know? It's just really addicting. DALEY: And unlike opioids, there's no federally approved medicine that treats meth addiction. Florence says meth is particularly insidious because it's cheap and easy to get. FLORENCE: It's very common. Everybody does it. DALEY: State drug overdose numbers confirm that trend. Meth was found in the systems of 280 Coloradans who died of overdoses in 2017. That's up sharply from the year before and more than heroin. Denise Vincioni directs the Denver Recovery Group. She says many who come to the treatment center use multiple drugs along with meth. DENISE VINCIONI: We're still seeing a rampant use of methamphetamine - very difficult to treat outpatient. DALEY: Even with treatment, the majority of users relapse within a year. Vincioni says, once, users mainly seemed to stick to one drug - opioid pills or heroin or cocaine. Now, she says they're using those in addition to meth. VINCIONI: You know, it decreases their chances of the continued sustained recovery. DALEY: Counselor Melissa McConnell says it can be a vicious cycle. MCCONNELL: People come in, they start to get off the opiates, but their meth use increases. DALEY: Most meth in the US is not cooked up in home labs, says Tom Gorman. He directs the Rocky Mountain High Intensity Drug Trafficking Area. He says it's mainly coming from one direction - south. TOM GORMAN: So I would say, almost 100 percent of our methamphetamine comes from Mexico. DALEY: Sometimes, via southern California and Phoenix. And in Denver, arrests for possession of meth nearly tripled last year compared to 2013. GORMAN: We've had a meth problem in this area for a long time. So are we having more people use meth? Maybe. But it's always been our No. 1 problem. DALEY: In the U.S., stimulants - mostly meth - claimed almost 6,000 lives in 2015. That was more than triple the number from a decade earlier, according to the CDC. At the Denver Recovery Group, Sarah Florance can tell you all about the dangers of meth. She's struggled with addiction to the drug for eight years. The turning point came after she became homeless. She stole a Subaru so she could sleep in it, but got caught and ended up in drug court. Florence says that led her to treatment. FLORENCE: It's just so much better quality life, now that I'm not doing any of anything, you know? This is the cleanest I've been since I was 15 years old. DALEY: And her counselor, Melissa McConnell, says she knows every month Florence can stay drug free, the better her chances of never going back. For NPR News, I'm John Daley. MONTAGNE: This story is part of a reporting partnership with NPR, Colorado Public Radio and Kaiser Health News. Transcript provided by NPR, Copyright NPR.